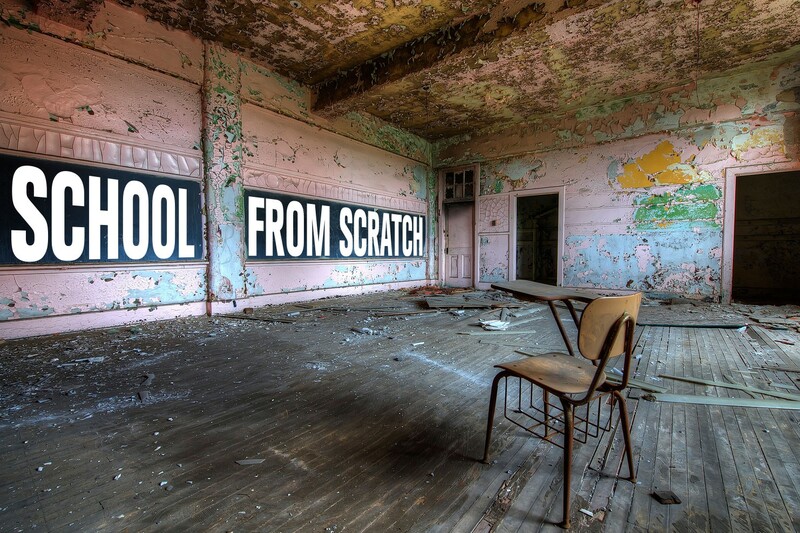 School from Scratch is a space for sharing ideas and information, and to incite discussion and debate regarding the transformation of public education. It’s also a space to think big about what schools might look and feel like for everyone involved in the public education experience. My name is Amy Satterthwaite, and I’m parent, futurist, and public school teacher. I also think of myself as a latent engineer, an ‘ideas person,’ and if I were independently wealthy I’d probably spend part of my time studying linguistics (especially semantics), semiotics, and learning a few more languages. In my not-so-recent past life I worked in artist-run centres and kept an art practice (mostly photography- and new media-based art). I recently completed the Master of Design program in Strategic Foresight and Innovation at OCADU in Toronto, Ontario, with a research focus on how futures education might be transformative for students who are disadvantaged in the public school system. My project is called Foresight for Every Kid and I’m currently editing the manuscript so that it might be published in a educator-friendly format. A little about schools: a decade of professional teaching has me crazy about kids, and inspired by some stellar professionals (you know who you are), but pretty disillusioned with the model of classroom teaching and learning within we we have to function (as administrators, educators, students and parents). I’m not convinced the way we do things is the best way – not even close, in fact. I get the impression, sometimes, that we’re simply rearranging deck chairs on the Titanic, if you know what I mean. While we have supposedly ‘time-tested’ ways of teaching kids, I deeply believe that every single child is an experiment, as we’ve yet to find any one teaching strategy or method that works for all people. While this may sound scary, I would argue that it’s liberating: if all teaching is an experiment, then why are we limiting ourselves to a very narrow swath of methods? It’s time we embrace the experiment and begin to aggressively pursue promising emerging pedagogy, to finally move ourselves away from a system built, and still reliant, on an industrial model. I’ll admit I’m hesitant, even, to think of schools as buildings, of the students as kids, or the teachers as certified. Right this second, I’m curious about how everything we take for granted in our understanding of public schooling might be turned on its head. I’m less interested in discussing curriculum-driven pedagogy,and more optimistic about the idea of schools evolving into hubs in communities – hubs that move us away from our current practice of tucking kids inside giant school buildings that only get used 2/3 of the year (just think about that one for a second…). Drop me a line below if you’d like to reach out! Suggestions for topics, questions, and feedback are all welcome and encouraged. I am so impressed with your energy /drive to draw a more creative / effective educational landscape for students! Good for you! You are a spark plug for educational reform! Francie – thanks for the feedback and encouragement! The kind of work you do already exists within the realm that I think school should be headed. You are definitely an inspiration!